Doris Lanning (center) with her daughters, Lynda (left) and Peggy (right). Dr. Lynda Lanning had limited time to talk. As soon as this interview was over, the internationally respected toxicologic pathologist would jump on a conference call with other researchers and policymakers to discuss how to protect the American public from the Zika virus. Still, Lynda and her mother, Doris Lanning, were excited to talk about the daughter’s life-changing experience at NC State University, and in particular their appreciation for the leadership development opportunities and support she received as an NC Fellow (now known as Caldwell Fellows), a program that the family supports to this day. Not minutes into talking with the mother-daughter duo, it became abundantly clear that this mother’s pride in her daughter’s achievements — and gratitude to the NC State community — continues today. As a freshman at NC State, Lynda heard about the NC Fellows (the predecessor to the Caldwell Fellows), a highly selective leadership development program, and decided to apply. She was one of 15 NC State students selected. As parents, the most important connections for Doris and her husband were those that helped ensure their young daughter’s safety as she traveled far beyond her North Carolina home. “The first time she went to Chicago to participate in a summer research program at Argonne National Lab through the NC Fellows, arrangements were made to have some NC State alumni pick her up at the airport, invite her to their homes and take care of her. The alumni, the professors, the Fellows program — everyone at State just took Lynda under their wings,” Doris said appreciatively. Argonne National Lab/University of Chicago. Doris thinks that NC State had a lot to do with that decision, too. Today, Lynda is a regulatory toxicologic pathologist at the National Institute of Allergy and Infectious Diseases/NIH in Bethesda, Maryland. She works on emerging biological threats, like the Zika virus, and on repurposing currently licensed therapeutics and using new vaccines to combat these emerging threats in veterinary and human medicine. “She’s been all over the world doing her work! From Japan to Australia, Ethiopia, you name it,” Lynda’s proud mother chimed in. Lynda remains deeply devoted to NC State, in particular to the Caldwell Fellows. She helps review student applications and returns to campus each year for interviews. She serves on the Caldwell Alumni Society and mentors Fellows while they are in school and after graduation. When she travels — which is often — she makes time to connect with other Caldwell alumni over coffee or lunch. One of Lynda’s favorite activities is interview day, an annual opportunity to meet the newest crop of candidates for the Caldwell Fellows and to reconnect with other alumni and mentors. In particular, she loves seeing Dr. Gerald Hawkins, the program’s original director, and Dr. Janice Odom, the current (and only other) director, who Lynda credits with advancing the program’s mission. 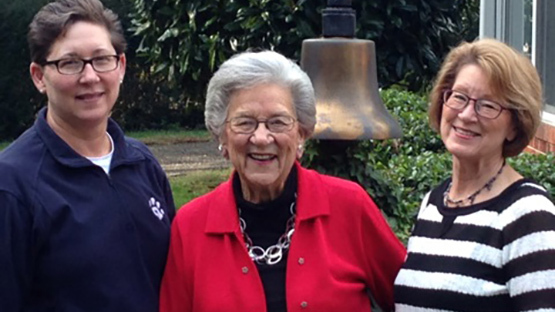 In 2004, Lynda established an endowment to provide long-term support for the Caldwell Fellows. The Lanning Fund provides enrichment funding for Fellows interested in biological and veterinary sciences so they can partake in experiential learning opportunities that might otherwise be cost-prohibitive. Spoken like a proud mom.